Uncomfortable Plot Summary: A man buys a house and then dies. First Sentence: Ten weeks before he died, Mr Mohun Biswas, a journalist of Sikkim Street, St James, Port of Spain, was sacked. 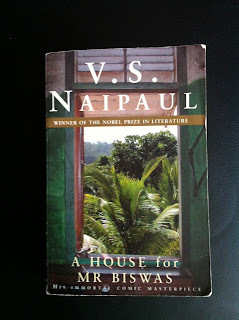 I think it's the prologue, rather than "the book proper," that reveals that Mr Biswas will someday have a house. Born into poverty on an estate in Trinidad, but a transplanted Hindu Brahmin (I only partly understand how the whole of that works, alas), he gradually works his way up to the position of newspaper reporter for one of the country's biggest papers. He also marries and has children. A million things happen. The book is his life story, all of his desire for a house to make his own. It's also about a similar evolution of Trinidad itself. Because of that, the book reminded me a lot of Midnight's Children. I hope that's not just a case of racism on my part (brown people, woo! ), but the two are really thematically similar as far as I'm concerned. The life story of a man, symbolic of a country's development and growth. Midnight's Children is the newer one of the two, and I'm not sure whether Rushdie was inspired by Naipaul at all. A House for Mr Biswas is no Midnight's Children, that's for sure (but at least it's better than A Bend in the River). It's not as funny or as beautiful to read. It's well-written, and Naipaul obviously has wisdom and insight, but the whole thing is just really grim and endless. The characters are pretty decent, except for Mr Biswas himself. He's obviously the one who we spend the most time with, and so this is definitely not a good thing. I feel like this book is a look at what happens when the whiny male characters like Augie March and Stingo live in mud houses. If I may get even more blunt, I don't think I was ever going to care about Mr Biswas. If not for The List, I never would've read a second one of Naipaul's books, or probably a first, for that matter. I'm sure that post-colonial narratives written by non-white people are a valuable thing to read, but this particular author leaves me cold. The book does explore or allude to some interesting concepts, like the communal life of the Tulsi family Mr Biswas' wife belongs to, the different languages spoken among different people, etc. But overall the book just dragged, and I'm glad I don't have to read any more of Naipaul's work. Lakhan the carter said, "But this is a fine man. He doesn't seem to care whether his son is drowned or not." "How do you know what he thinks?" Bipti said. "Leave him, leave him," Raghu said, in an injured, forgiving tone. "Mohun is my son. And if I don't care whether he is drowned or not, that is my business."